‘Our review analysed 51 studies, which provided information on 433 separate substitution factors. 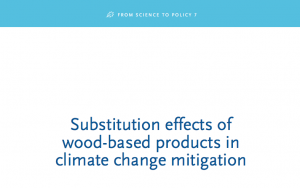 The large majority of studies indicate that the use of wood and wood-based products are associated with lower fossil and process-based emissions when compared to non-wood products. Overall, the 51 reviewed studies suggest an average substitution effect of 1.2 kg C / kg C, which means that for each kilogram of C in wood products that substitute non-wood products, there occurs an average emission reduction of approximately 1.2 kg C.
Hackitt to spur innovation in taller cross-laminated timber buildings Should the UK look to Sweden to solve its housing crisis?